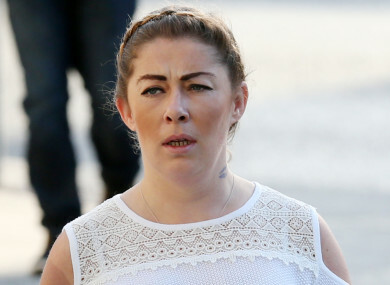 A 37-YEAR-OLD WOMAN has been found guilty of attempting to murder a civil servant by slashing her neck as she walked home from work in Dublin two years ago. Laura Kenna had argued that she was legally insane at the time and had attacked Fionnuala Burke in the context of delusions about death, vampires and cannibalism. Kenna, of no fixed abode, was charged with attempting to murder Burke on Lower Drumcondra Road in the city on 3 January 2017, and of assault causing serious harm to her on the same occasion. She had pleaded not guilty by reason of insanity to both counts and went on trial at the Central Criminal Court. The trial heard that Burke was working for the Department of Social Protection, and was walking home when she noticed a woman sitting on a wall outside a house. As Burke approached, the woman, Laura Kenna, sprang up and pushed her back onto a grassy area. Kenna didn’t say anything but started to stab her. Burke felt the short stab wounds and could also feel her face being slashed before she felt a dramatic slash straight across her neck. Kenna then spoke, telling Burke that she’d let her go if she handed over her bag. The jury saw photographs of the large, deep cut across Burke’s neck. It had penetrated through muscle and cut through the thyroid gland. She was operated on and treated in intensive care after the attack. She also had other injuries to her face and body. I sliced her like you would a goat. The main issue for the jury to consider was Kenna’s state of mind at the time; there was a conflict of opinion between the experts on this issue. A consultant psychiatrist engaged by the defence testified that the accused was suffering from a mental disorder at the time, and so was entitled to the special defence of not guilty by reason of insanity. Dr Stephen Monks of the Central Mental Hospital (CMH) told the jury that she was suffering from schizoaffective disorder, a chronic mental illness related to schizophrenia. He said she had carried out the ‘frenzied and vicious’ attack on Burke with the intention of killing in the context of delusions about death, vampires and cannibalism. She had a knife for the purpose of killing somebody, he added. He testified that she did not know the nature and quality of her actions and couldn’t stop what she was doing. However, a consultant psychiatrist engaged by the State disagreed. Professor Harry Kennedy, also of the CMH, testified that she was not delusional at the time, but carried out the attack in anger and out of a ‘sense of entitlement’; she told gardai she’d needed money. Prof Kennedy said her attack would not come under the definition of insanity. He said that she possessed ‘callous’ and ‘unemotional’ personality traits and had the ability to ‘fabricate for her own interests’. She’d told him that she had followed another woman that night ‘but let her go’, something he said indicated that she knew what she was doing in selecting her victim. Barristers for both sides delivered their closing speeches yesterday. Barry White SC, defending, reminded the jury that both doctors had agreed that Kenna had fit the criteria for the special insanity verdict when she had attacked another woman a few weeks before this attack. A jury, in that case, had later reached a verdict of not guilty by reason of insanity on that charge. However, he pointed out that Prof Kennedy considered her to have a mental disorder after the Drumcondra attack, but not during it, and said the professor had ‘Ms Kenna going from mad to bad to mad’. “You heard from Dr Monks that this is highly improbable,” he said. Anthony Sammon SC, prosecuting, reminded the jury that he had said at the outset that this would not be an easy case. “I did not tell you that this was a retrial and that another jury had struggled with this,” he said, referring to a previous jury failing to reach a verdict, something the defence had disclosed in this trial. “That is now known to you and it endorses the statement I made that this is a difficult case,” he said. He noted that there was no blood test that could establish a mental condition. “One has to go through the torturous process that has been revealed to you in this case,” he continued, referring to the doctors’ interviews with the accused and reviews of her history. He explained that the Oireachtas had decided that 12-citizen juries would have to answer the question of insanity. The six men and six women of the jury were told that the State had to prove beyond a reasonable doubt that Kenna had carried out the attack. However, the defence had to prove only on the balance of probabilities that she satisfied the special defence of not guilty by reason of insanity. Justice Tara Burns sent them out to begin considering their verdict yesterday afternoon. They had spent a total of two hours and 23 minutes deliberating before reaching their unanimous verdict of guilty on both counts. Justice Burns said she was extremely grateful to them for their work on what had been ‘a particularly difficult case’ and exempted from jury service for 10 years. She adjourned sentencing until Monday 25 March for preparation of a victim impact statement. She also directed a report from Kenna’s treating doctor. Email “Woman found guilty of trying to murder stranger as she walked home from work ”. Feedback on “Woman found guilty of trying to murder stranger as she walked home from work ”.